Background Knee reinjury after ACL reconstruction is common and increases the risk of osteoarthritis. There is sparse evidence to guide return to sport (RTS) decisions in this population. Objectives To assess the relationship between knee reinjury after ACL reconstruction and (1) return to level I sports, (2) timing of RTS and (3) knee function prior to return. Methods 106 patients who participated in pivoting sports participated in this prospective 2-year cohort study. Sports participation and knee reinjury were recorded monthly. Knee function was assessed with the Knee Outcome Survey—Activities of Daily Living Scale, global rating scale of function, and quadriceps strength and hop test symmetry. Pass RTS criteria were defined as scores >90 on all tests, failure as failing any. Results Patients who returned to level I sports had a 4.32 (p=0.048) times higher reinjury rate than those who did not. The reinjury rate was significantly reduced by 51% for each month RTS was delayed until 9 months after surgery, after which no further risk reduction was observed. 38.2% of those who failed RTS criteria suffered reinjuries versus 5.6% of those who passed (HR 0.16, p=0.075). More symmetrical quadriceps strength prior to return significantly reduced the knee reinjury rate. Conclusions Returning to level I sports after ACL reconstruction leads to a more than 4-fold increase in reinjury rates over 2 years. RTS 9 months or later after surgery and more symmetrical quadriceps strength prior to return substantially reduce the reinjury rate. The aims of this study were therefore to assess if the 2-year risk of a knee reinjury after ACL reconstruction was associated with (1) return to level I sports, (2) timing of return to level I sports and (3) knee function prior to return to level I sport. This cohort consists of the ACL-injured patients in the Norwegian arm (n=150) of the Delaware-Oslo ACL Cohort Study (n=300) who underwent ACL reconstruction (n=106).5 Patients were consecutively screened for inclusion at the Norwegian Sports Medicine Clinic between 2007 and 2011. We included patients who had sustained a unilateral ACL rupture within 3 months of enrolment (verified by MRI and ≥3 mm side-to-side difference in anterior laxity measured by KT-100021). Other inclusion criteria were age between 13 and 60 years and preinjury participation in level I or II sports10 at least twice weekly. Patients were excluded if they had current or previous injury to the contralateral knee, previous knee injury on the index knee, or concomitant grade III knee ligament injury, fracture or full-thickness cartilage defects. Patients with meniscus injuries were excluded only if they had pain or effusion during plyometric activities that had not resolved 3 months from injury. Approval from the Regional Committee for Medical Research Ethics was obtained, and written informed consent was acquired, prior to inclusion. All patients underwent our previously published preoperative rehabilitation programme.22 Further treatment (surgery or continued rehabilitation) was decided after this 5-week programme. The ACL reconstruction was performed in one of seven different hospitals, using bone-patellar tendon-bone (BPTB) or a hamstrings autograft. The postoperative rehabilitation was individually tailored on the basis of concomitant surgery, graft choice and function. Rehabilitation consisted of three phases: the acute phase where the aims were to eliminate effusion and range of motion (ROM) deficits and minimise muscle atrophy. The rehabilitation phase where the aims were to regain neuromuscular control of terminal knee extension in weight-bearing positions and to regain ≥80% muscle strength and hop performance. The last phase, the RTS phase, aimed at regaining ≥90% muscle strength and hop performance, while transitioning to sport through sport-specific drills and gradual participation. Patients were advised against full participation in level I sports if they had not regained >90% quadriceps and hamstring strength and hopping performance compared with the uninjured leg. Starting the first month after ACL reconstruction, sports participation data were collected monthly using an online activity survey.11 Patients reported which sports they participated in by ticking a box for the respective sport. Each month, one reminder was automatically sent out to patients who had not responded after 1 week. The online activity survey has excellent test–retest reliability (κ=0.92 for level I sports participation).11 Knee reinjuries with an acute onset were recorded through the online survey and at clinical follow-ups at 6 months, 1 year and 2 years after reconstruction. The injuries were diagnosed according to the standard practice at our clinic. Of 24 reinjured patients, 2 were diagnosed after clinical examination, 10 after clinical examination and MRI, 5 after clinical examination and arthroscopic surgery, and 7 after clinical examination, MRI and arthroscopic surgery. The comprehensive RTS test battery19 ,23 ,24 investigated in this study consisted of isokinetic quadriceps strength testing, four single-legged hop tests and two self-report outcomes.23 ,24 These data were collected at baseline (mean 2.1±0.6 months after injury) and at 6 and 12 months after surgery. Isokinetic concentric quadriceps strength was measured at 60°/s with an electromechanical dynamometer (Biodex6000, Biodex Medical Systems, Shirley, New York, USA). Four submaximal practice trials were followed by 1 min rest before five maximum effort repetitions were recorded. After strength testing, four hop tests were performed in the following order: single hop for distance, crossover hop for distance, triple hop for distance and 6 m timed hop.25 ,26 All patients performed one practice trial hop and then two hops were recorded. The uninvolved leg was always tested first. After the hop testing, patients completed the Knee Outcome Survey—Activities of Daily Living Scale (KOS-ADLS)27 and a global rating scale (GRS) of perceived function.23 The KOS-ADLS is a 14-item self-reported assessment of symptoms and function in activities of daily living, scored from 0 (worst) to 100 (best). The GRS asks the patient to rate current knee function on a scale from 0 (not able to perform any activity) to 100 (level of function prior to the knee injury). Return to level I sport was defined as any reported participation in handball, football, basketball or floorball, regardless of training/match participation or level of competition. The first recorded participation in level I sports was reported in months after surgery. A Cox proportional hazards regression model with months after surgery as the time variable was used to assess the reinjury rate in patients who participated in level I sports after surgery versus those who did not. Cox regression models were also used to assess the association between knee reinjury and time of return, and knee function prior to return to level I sports. Time 0 was defined as the first month of level I sports participation to limit bias from more sports exposure in patients who returned early to level I sports. The independent variables were months from surgery to RTS, passing/failing RTS criteria and continuous LSIs of the individual RTS variables. Separate results were reported for those who returned before and after 9 months after surgery, as the assumption of proportionality was violated in the analysis of time of return. All analyses were adjusted for age. Two-sided p values ≤0.05 were considered statistically significant. From the original 106 patients who underwent ACL reconstruction, 100 (94.3%) had data on sports participation and knee reinjuries (1 withdrew from the study, 5 did not respond to the online activity survey). The monthly data on sports participation and reinjuries were 92.9% complete for the 100 patients (2230 reports in total). Descriptive characteristics of the cohort can be seen in table 1. In total, 74 of the 83 patients who previously participated in level I sports returned to level I sports within 2 years of ACL reconstruction. None of the 17 who did not participate in level I sport before injury participated in level I sports after surgery. The mean number of months participating in level I sports was 8.1±5.7 over the two postoperative years. The time of return to level I sports varied from 3 to 23 months after surgery, with a median of 8 months after surgery. In total, 69 of the 74 (93.2%) patients who participated in level I sports underwent functional testing prior to RTS. One patient did not attend any of the follow-ups. Four patients returned to sport fewer than 5 months after surgery. All four of these patients suffered a knee reinjury within 2 months of return. The mean time from functional testing to return to level I sport was 2.3±2.4 months. 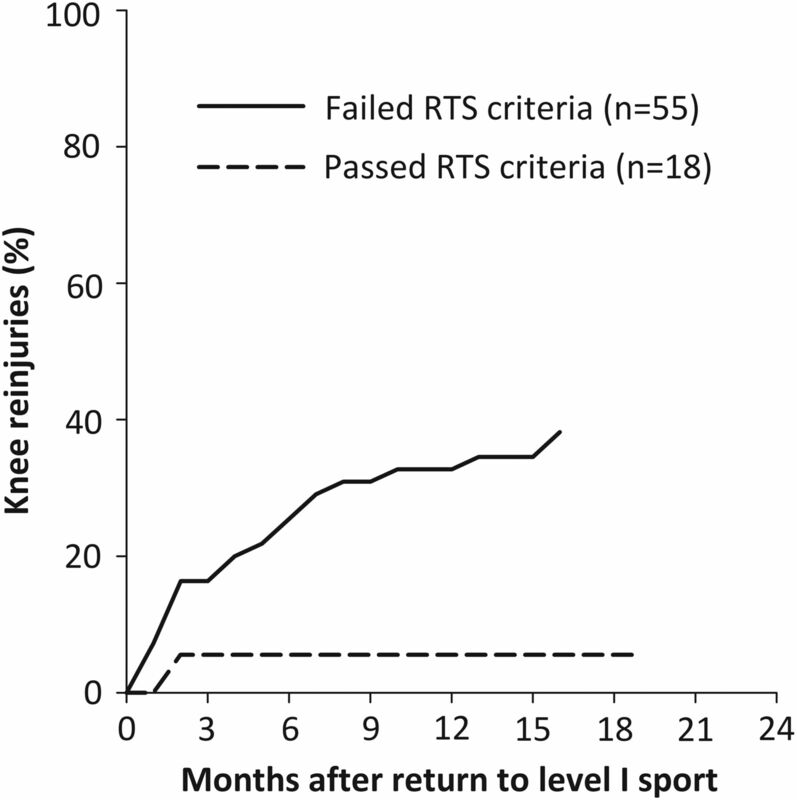 Of the 49 patients who returned to level I sports 5–11 months after surgery, 7 (14.3%) had passed the RTS criteria at the 6-month follow-up test. Eleven of the 20 patients (55.0%) who returned to level I sport 12–23 months after surgery had passed the RTS criteria at the 12-month follow-up. In total, 18 of the 74 patients (24.3%) were classified as having passed the functional RTS criteria prior to RTS. Twenty-four (24.0%) patients sustained 28 knee reinjuries, including 8 ACL graft ruptures and 8 medial meniscus injuries (table 2). The reinjuries occurred from the 3rd to the 22nd postoperative month, with a median of 13 months after surgery. The time between returning to level I sports and sustaining a knee reinjury varied from <1 month to 16 months, with 45.5% of the reinjuries sustained within 2 months of RTS. In the 26 patients who did not return to level I sports, two reported a knee reinjury (7.7%). The 2-year reinjury risk in patients who returned to level I sports after surgery was 29.7% (22 of 74). After adjusting for age, patients who participated in level I sports after ACL reconstruction had a 4.32 (95% CI 1.01 to 18.40, p=0.048) times higher reinjury rate than those who participated in lower level sports (figure 1). 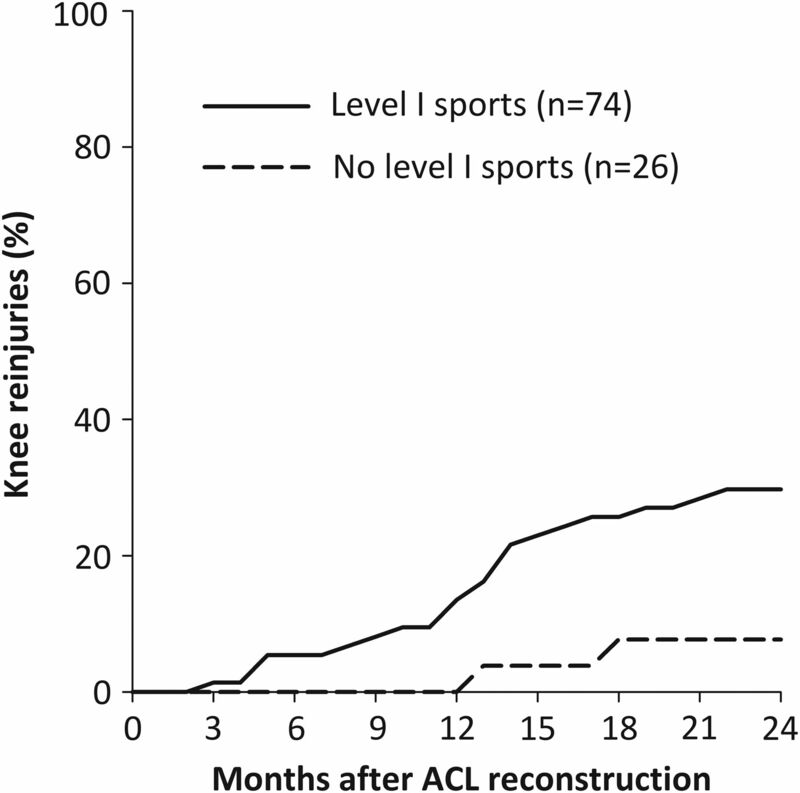 Knee reinjuries after ACL reconstruction in those who participated in level I sports and those who did not. During the first 9 months after surgery, a later RTS was significantly associated with a lower reinjury rate. For every 1 month delay in RTS, the reinjury rate was reduced by 51% (table 3). In patients who returned between 9 and 23 months after surgery, time to return was not significantly associated with knee reinjury. Patients who participated in level I sports earlier than 9 months after surgery sustained 39.5% reinjuries (15 of 38), compared with 19.4% knee reinjuries (7 of 36) in those who returned to level I sports later than 9 months after surgery. Of the 55 patients who failed RTS criteria, 21 (38.2%) suffered knee reinjuries (figure 2). Only 1 of the 18 patients (5.6%) who passed RTS criteria suffered a knee reinjury. Patients who passed the RTS criteria showed a not statistically significant 84% lower reinjury rate (HR 0.16 (95% CI 0.02 to 1.20, p=0.075)). Of the individual components in the RTS test battery, quadriceps strength deficit prior to return to level I sport was a significant predictor of a knee reinjury, with a 3% reduced reinjury rate for every one percentage point increase in strength symmetry (table 3). Fifteen of the 45 patients (33.3%) who returned to level I sport with quadriceps LSI<90% suffered reinjuries, versus three (12.5%) reinjuries in the 24 patients who had quadriceps LSI>90% prior to return. Knee reinjuries after return to level I sports in those who failed and those who passed return to sport (RTS) criteria prior to return. This 2-year prospective study showed that the knee reinjury rate was over four times higher in ACL reconstructed patients who returned to level I sports after surgery. Furthermore, returning to sport earlier after surgery and having asymmetrical quadriceps strength prior to return increased the risk of knee reinjury. Previous studies on time to sports return and the risk of contralateral ACL rupture or ACL graft rupture have shown conflicting evidence.3 ,16 ,31 Different sports place different demands on the knee, and our finding of an increased risk with earlier sports return may be specific to athletes who return to level I sports. The increased risk could be due to insufficient biological healing (eg, graft incorporation and remodelling), incomplete rehabilitation or both. Our results suggest that time to return is associated with reinjury, and the effect is larger in the early months after surgery. Of note, all patients who returned to sport before 5 months suffered a knee reinjury. Beyond 9 months after surgery, we did not find a statistically significant reduction in the risk for knee reinjury. Still, 19.4% of these patients also suffered knee reinjuries. Time alone is therefore not sufficient for determining readiness for level I sports participation. Our findings support the use of both time-based and functional RTS criteria. There was an estimated 84% lower knee reinjury rate in patients who passed RTS criteria, a magnitude of high clinical relevance. This finding was not statistically significant (p=0.075), most likely due to the low statistical power, as only one of the 18 patients who passed the criteria and returned to sport suffered a knee reinjury. The low proportion of patients who passed RTS criteria is not surprising as the investigated RTS battery was not used to determine when patients were cleared to RTS in our study. Further, patients were tested 2.3±2.4 months prior to return, and a higher number of patients might have passed had they undergone testing immediately prior to RTS. We have previously reported similar rates of passing RTS criteria at 6 months for the entire Delaware-Oslo ACL Cohort.23 The rate of passing RTS criteria was 52.5% at 1 year after surgery,23 and only 66% had quadriceps strength symmetry ≥90% 2 years after surgery.5 These outcomes exist in a cohort that has shown superior patient-reported outcomes compared with the general ACL reconstructed population,32 suggesting that even larger functional deficits might persist after usual care. While we still do not know the optimal content of an RTS test battery,19 our results show that quadriceps strength testing should be included. Asymmetrical quadriceps strength at the time of RTS is associated with asymmetrical knee biomechanics during hopping,33 which in turn has been found to predict a second ACL injury.34 Quadriceps weakness is also a risk factor for knee OA,35 further highlighting the importance of thorough rehabilitation and quadriceps strength assessment. Postural control deficits and altered neuromuscular control of the hip and knee have also been found to predispose an athlete to a second ACL injury.34 So far, modifiable risk factors for reinjury after ACL reconstruction have only been identified using sophisticated testing equipment (isokinetic dynamometry and 3-dimensional motion analysis), and a future focus should be to validate more clinically accessible tests. The main strength of this study is the frequent follow-up and high follow-up rate of ACL reconstructed patients who were consecutively screened for inclusion at one sports medicine clinic. A main limitation is the lack of exact athlete exposure time. RTS was defined as their first participation in a level I sport, and not necessarily full participation including match play. We were unable to control for the exact time spent in sports, full or limited participation, and training/match exposure. Athletes who undergo ACL reconstruction should be informed that postoperative participation in level I sports increases the 2-year knee reinjury rate more than four times. A later return to level I sports and more symmetrical quadriceps strength prior to return decreases this rate significantly. A combination of strict time-based and functional RTS criteria therefore has great potential to improve long-term function, substantially decrease the prevalence of post-traumatic knee OA in these patients, and reduce downstream healthcare costs. In the first 2 years after ACL reconstruction, 30% of people who returned to level I sports sustained a reinjury compared with 8% of those who participated in lower level sports. For every month that return to sport was delayed, until 9 months after ACL reconstruction, the rate of knee reinjury was reduced by 51%. More symmetrical quadriceps strength prior to return to sport significantly reduced the knee reinjury rate. Clinicians should inform patients of the increased risk of knee reinjury if they decide to return to level I sport. Strict time-based and functional return to sport criteria should be implemented. Return to level I sport should be delayed until at least 9 months have passed from surgery and the patient has regained quadriceps strength comparable to the uninjured side. The authors thank Ingrid Eitzen, Annika Storevold, Ida Svege, Espen Selboskar, Karin Rydevik and Marte Lund for their assistance in data collection for this study. They acknowledge the Norwegian Sports Medicine Clinic, NIMI (http://www.nimi.no), for supporting the Norwegian Research Center for Active Rehabilitation (NAR; http://www.active-rehab.no) with rehabilitation facilities and research staff.
. Clinical, functional, and radiologic outcome in team handball players 6 to 11 years after anterior cruciate ligament injury: a follow-up study. Am J Sports Med 2003;31:981–9.
. Development of a patient-reported measure of function of the knee. J Bone Joint Surg Am 1998;80:1132–45.
. How does a combined preoperative and postoperative rehabilitation programme influence the outcome of ACL reconstruction 2 years after surgery? A comparison between patients in the Delaware-Oslo ACL Cohort and the Norwegian National Knee Ligament Registry. Br J Sports Med 2015;49:385–9. Contributors All authors contributed to the conception and design of the study. HG and HM were responsible for data collection. HG performed the data analysis and all the authors contributed to the interpretation. HG drafted the manuscript and all the authors revised it critically and gave their approval of the final version. Funding National Institutes of Health (R37 HD037985). Ethics approval South Eastern Norway Regional Committee for Medical Research Ethics.